When approaching a ferry crossing, reduce speed to 4 knots within 100 metres and maintain it for 100 metres on the other side of the crossing. Never pass in front of a ferry. Never pass close to a ferry that is crossing the river. The heavy steel cables used to guide the ferry may be close to the surface and can seriously damage a boat. Stay at least 30 metres away from the ferry. Always slow down and if necessary stop and wait for the ferry to reach the bank before crossing. If your vessel is fitted with a horn, a four- to six-second blast should be sounded when approximately 500 metres away from the crossing. If your vessel is not fitted with a horn then approach the ferry with caution. The ferry operator will let you know if the ferry is not leaving the river bank by displaying a green flashing light when at rest on either side of the river. At Mannum where there are two ferries, proceed when either one or both are showing their green flashing lights. 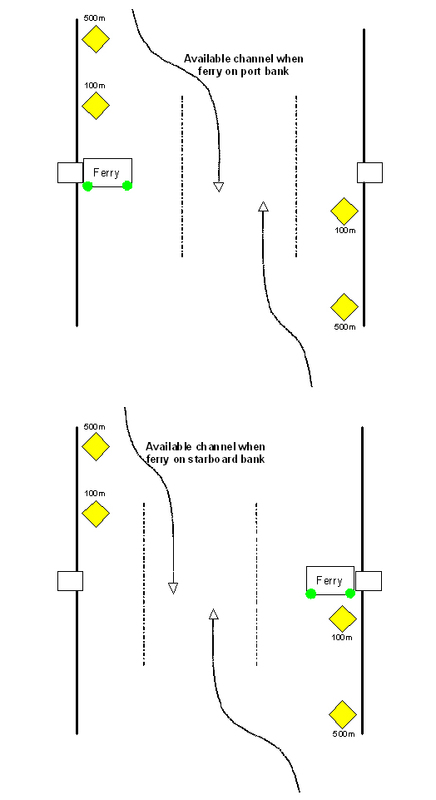 At the 100-metre mark, vessels should be manoeuvred towards the available channel - see diagram below.